Our local flight school held their annual show this past Saturday. 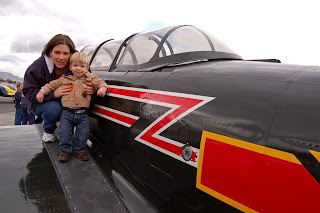 Since Cory has recently discovered what airplanes are we thought it would be fun to take him. We/he was not disappointed! 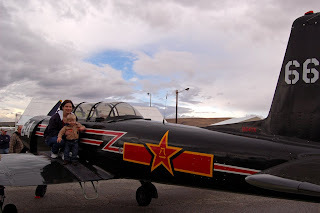 This was a Chinese fighter trainer that a guy had bought. It was in very good condition and Brian got all the history (I was too busy chasing Cory!). He let anyone who wanted to climb up on it and look in the cockpit. The stick was moving all around on it's own because it wasn't tied down and the flaps were moving in the wind. There were plenty of small planes taking off and landing for Cory to watch. The airport fire truck drove by and showed off it's spray. Also the Miss Veedol replica took off - that's the first plane to make a trans-Pacific flight without stopping back in the 30's or something. And they made it as far as us in Eastern Washington. They were giving rides for $20, which is a pretty good deal. But a guy standing next to us said it wasn't a good day, he'd just come back and it was so windy (and rainy) that you wouldn't enjoy it. So we passed on that opportunity to lose our lunch! Join in with Photo Story Friday over at Cecily's. I would have loved a day like that -- minus the weather. 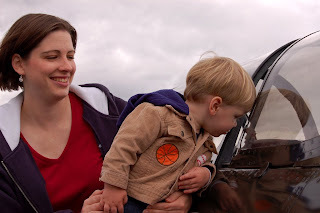 That shot of your son looking in to the plane is a great one. Oh wow! I would definitely want to see that and would definitely want to ride that jet! Look at your son he is so curious! A pilot in the making? Nice photostory! Mine is about the HongKong skies check it out here. What a fun day! Very cute pictures. That looks like a lot of fun!! He looks so happy to be with those planes! Oh, I LOVE that last shot!! He just looks so honestly and clearly interested!! Good gosh he's getting big...and cuter every time I see a new picture of him! The perfect day for a little guy. My son (and daughter) would have loved that too. Great pictures! oh my! Cohen would love something like that- how fun! That looks like it was fun. It's so wonderful to see your child enjoying things like that. I love it when children get the real life experiences. Those kinds of field trips are so important. So glad you had such a great time! I had the same thought about the election- if hilary had won, I wouldn't have had to think about it- I even said I would get rid of my TV if she won just so I didn't have to see her for the next 4 years. I bet the little boy had a grand time! Boys just love airplanes don't they?